Mia is always looking for signs. A sign that she should get serious with her soccer-captain boyfriend. A sign that she’ll get the grades to make it into an Ivy-league school. One sign she didn’t expect to look for was: “Will I survive cancer?” It’s a question her friends would never understand, prompting Mia to keep her illness a secret. The only one who knows is her lifelong best friend, Gyver, who is poised to be so much more. Mia is determined to survive, but when you have so much going your way, there is so much more to lose. From debut author Tiffany Schmidt comes a heart-wrenching and ultimately uplifting story of one girl’s search for signs of life in the face of death..
Just reading the description alone I felt this was going to be an emotionally tough book I'd have to brace myself for. A girl finds out she has cancer? Devastating! Trying to bottle up that secret and keep it to yourself? So incredibly sad and a possible ticking time bomb waiting to explode! I was prepared. Tissues and all! I will say that I didn't need the tissues and I'll tell you why below! I truly enjoyed this novel despite some times I just was exasperated by it! I didn't mean to lay in bed all day and read it but it just happened. Whatcha going to do? Laundry & dishes be damned! I just was so absorbed in this story, frustrations and all, -- her journey with accepting her situation, when she was going to tell her friends, how her friends were going to take it if she told them, the whole situation with her & Gyver and ultimately what was going to happen with her life after this diagnosis. It was all written in a way that you found yourself just flipping page after page because you just need to know what happens! I LOVED Gyver. So much. Talk about a swoonworthy guy! I rooted for Mia and Gyver so hard. It just made me do all sorts of hands to my chest swoony sighs and "Awwws." I do think, and have chatted about it with others who have read this, that I wished that mayyybe Mia didn't rely on Gyver SO much. I mean, I get their relationship, but this is where I just wanted to jump in the book and talk to Mia about some things. About how she really needs her girl friends. And how she's going through a hard time and relying on ONE single boy could be disastrous. I kind of wanted Mia to stop focusing on the boys so much (though I know it made her feel so normal) and fight for herself and find some strength within. But at the same time, as soon as I put myself in her shoes and how it must feel to go through this -- I tried to cut her some slack. I remember how my mom hated telling people about her cancer because everyone starts treating you differently in their own various ways. Some want to smother you, some don't know what to say and they just act awkward, etc. But not going to lie, it was hard to stomach how she dealt with it. I'm going to WARN you that you are going to battle with Mia in your mind because sometimes she is just so DARN SELFISH and made her life so much more complicated! You are going to want to yell at her. I did. She's not really that sympathetic. Which I thought that was kind of interesting because you feel so torn because you are supposed to feel bad for her in a way. That little debate in my head was kind of interesting because I know how much my mom just wanted to not be treated all fragile like BECAUSE she had cancer. So the fact I was making excuses for her just made me have a very interesting dialogue in my head. 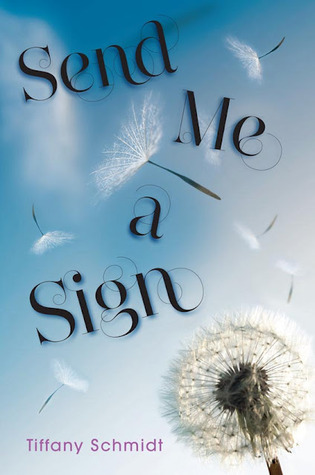 Send Me A Sign was one of those books that pulled and tugged at your heart but not in the punch-you-in-the-gut-way that some "cancer books" might. It seemed a bit more subtle perhaps because of the way Mia was dealing it and how she seemed more focused on the boys in her life. It seemed almost at a distance in some places because of her approach to dealing with it. But then came those moments where your heart just radiated from the hurt and the heaviness. Just in the right places. I had that debate too! I felt bad for being mad at her since she was dealing with cancer but then I resolved it by reminding myself that she's fictional so what does she care what I say about her?! I enjoyed the writing a lot but Mia was just so frustrating! Hmmm sounds like a good book, which will drive me crazy but I might just love it anyway. Will have to give it a go! Great review! Great review! Definitely adding this one to my TBR. I love emotionally-complex stories.